Meet Janet and Steve, two new friends from New Zealand who have moved to Kutch to build an orphanage shown in the background. Since the folk arts of Kutch are passed down from generation to generation, we have a heart to to help Janet teach the orphans who will live here the traditional crafts of the region. The value of the tradition will be lost if it is taught by us, but we are sure we could entice some of the older women in nearby villages to do classes for them. Janet and Steve were already building a workroom for teaching sewing, tailoring, etc, without even knowing we would be introduced. We met them as we headed to another village and they were way out on a road. We never even planned to meet, as we were not sure they were there. Hardly an accident – all things work together for good. 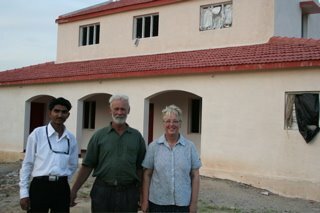 They are living without water or electricity as they build the orphanage and they are an amazing, committed couple.